It might have taken longer than expected but code within OS X 10.11.1 starts to shine a light on a possible launch of a new Magic Trackpad 2, Magic Mouse 2 & Magic Keyboard . For those who use multiple devices that are on different platforms, finding a keyboard that can switch from one device to another and from one OS to another seamlessly can be a challenge. The Logitech Bluetooth Multi-Device Keyboard K480 offers not only wireless Bluetooth compatibility with all smartphones, tablets and computers with Bluetooth HID profile support, but it also offers a switch dial that lets you connect with one of your three connected devices to the keyboard in a flip of a switch. The Logitech K480 keyboard is spacious and has a standard layout. The Logitech Bluetooth Multi-Device Keyboard K480 measures 11.77 x 7.68 x 0.79 inches. It’s almost as wide as a standard desktop keyboard minus the dedicated number pad, and it feels as spacious as a desktop keyboard on the main deck. The Bluetooth keyboard is heavier than most mobile keyboards, weighing 1.81 pounds as it’s designed to stay either in your office or home on a coffee table. The keyboard is however designed to work with your smartphones and tablets as it has a sturdy dock cradle to hold your mobile devices at a comfortable viewing angle when you type on the keyboard. The cradle has soft touch rubber surface and it can hold a 10″ tablet, or a smartphone and an 8″ tablet securely and steadily. The Logitech Bluetooth Multi-Device Keyboard K480 has wireless built-in and needs 2 AAA batteries to power it. The batteries are included and should last you up to 2 years. The keyboard tilts slightly forward that makes typing easier, but the tilt isn’t steep enough to relieve the fatigue in your wrists from long periods of typing. The K480 has a power on/off slider on the bottom and the power LED light lives right next to the power slider. The Logitech Bluetooth Multi-Device Keyboard K480 comes in two colors: black with yellow docking cradle and OS selector dial, and white with gray cradle and dial. 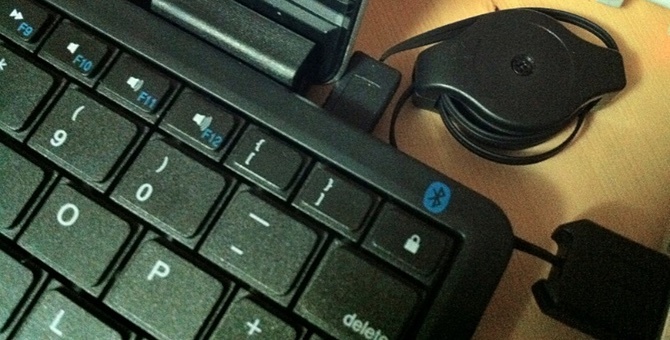 Five rubber feet help prevent the keyboard from sliding on slippery surface. The Logitech K480 has built-in Bluetooth and can work with most devices that support Bluetooth HID profile. The supported platforms include Windows 7 and Windows 8 or later, Mac OS X and later, Chrome OS, iPhone/iPad with iOS 5 and later, and Android tablet and smartphone with Android 3.2 and later. The only major mobile OS that’s not supported is the Windows Phone which still has limited support for Bluetooth HID. Pairing and connecting the Logitech K480 is super easy. There’re two Bluetooth buttons above the keyboard deck. One that’s marked “i” puts the keyboard in pairing mode for all iOS and Mac OS devices and computers, and the one that’s marked “PC” puts it in pairing mode for all other OS platforms. We tested the Logitech K480 with several smartphones, desktop computers and tablets, and found that it paired and connected with all easily. The Logitech K480 offers one special feature that makes connecting the keyboard with all your devices quickly without the need to re-discover or re-connect. The keyboard has a three-position dial that allows you to switch among three connected devices with flip of the switch. In our tests, switching among the connected devices has been instantaneous regardless which device on which platform was connected to the keyboard. The Logitech Bluetooth Multi-Device Keyboard K480 isn’t designed to replace your full sized desktop keyboard with dedicated directional keys, full Function keys (up to F16) and a dedicated number pad. But its width almost matches a full sized keyboard’s and that means the keyboard has plenty of room for key spacing and good-sized keys. The Logitech K480 has slight oval shaped keys that are large enough for most people, and a standard US keyboard layout. The key’s surface is matted so that your fingertips won’t slide off, which is a good thing because the keys offer a bit more resistance than a normal desktop keyboard and you’ll need to hit the key a bit hard. But fluent touch-typists shouldn’t take long to type on the K480 smoothly. The sound of the key clacking is tuned to dampen but it sounds a little like a court transcript typewriter, not like normal computer keyboard’s sound. The Logitech Bluetooth Multi-Device Keyboard K480 inherits the smooth typing experience that usually comes with Logitech mobile keyboards. Though the heavy keyboard isn’t designed to jump into your gear bag for road trips, it offers convenient features to work with all your mobile devices including tablets and smartphones on most platforms. The easy switching among your devices comes in very handy for those who need to type email on a tablet and then quickly respond to a texture message on their phone. We like the cradle slot that’s built into the keyboard and holds tablets and smartphones, and we like the smooth typing on the spacious keyboard. Bluetooth means you can take the keyboard away from the devices or computers but it also means you don’t get a USB port for a wired mouse. Other things to keep in mind: the sound of the key clicking is tuned differently from most keyboards, the forward tilt isn’t steep enough for more comfortable typing and the Logitech Keyboard Plus app is only available on Android for international keyboard layouts. Anyone wondering just how well the Bryde Keyboard can grip your iPad? Here’s a quick video to show you just how much grip that thing has. Reviewed : iKeyboard – Making typing on the iPad that little bit easier? The kickstarter funded project for iKeyboard is up and running with their own website and products are shipping. After a considerable wait we finally receive our (paid for) iKeyboard. So the immortal question is, does it make iPad typing any less of a chore. Continue reading → Reviewed : iKeyboard – Making typing on the iPad that little bit easier? I was all prepared the other day to venture out into the world and do some blogging with the “Pad” and the bargain Xenta Mini Bluetooth Keyboard with iPad stand. That was until the very second I tried to use the bloody thing and instantly had buyers remorse for purchasing such a big pile of crap.